Guatemala, “the place of many trees” in the native Náhuatl language, is the most populated country in Central America and the birthplace of chocolate bars (thank you). Guatemala borders Mexico, Belize, Honduras, El Salvador, and both the Pacific Ocean and the Caribbean sea. The country has beautiful flora and fauna, on which it rightly prides itself (the nation’s currency is named after the national bird quetzal). Guatemala is one of the centres of many pre-Columbian civilisations, notably the Maya who inhabited the regions for over a thousand years. The nation achieved independence in 1821, the same year as El Salvador, Honduras, Nicaragua, and Costa Rica with which it initially formed a short-lived Federal Republic of Central America. As for many Central American nations, it was led to independence and then taken over by a rural landowning elite which imposed its misguided belief that labour in the worst of conditions was preferable to providing education and welfare to its people. From 1960 to 1996, Guatemala was torn by a civil war fought by an alliance between left-wing rural landless farmers and native Maya on one side versus a central right-wing military dictatorship. The conflict was backed by Soviet and US superpowers, who saw another opportunity for a proxy war of influence. The Guatemalan government was condemned for genocidal action and war crimes whilst Maya activist Rigoberta Menchù received the 1992 Nobel Peace Prize for her work in defence of indigenous populations. The land of the eternal spring, as it is also called, is the largest economy in Central America. More than 50% of the population works in agriculture, mostly related to the production of coffee. Another 35% of the workforce is employed by the tourism industry (check out Lake Atitlán, the deepest in Central America and widely regarded as the most beautiful lake in the world). The rest work in industries such as sugar, textiles, clothing, chemicals, metals and rubber. Guatemala suffers from high levels of inequality and is on the frontline of the war on drugs and cartels. The country faces social, economic and political challenges but is on the path to sustainable development and equality among its people. It is as beautiful and diverse as it is ambitious in its goal to create a just and resilient country. Guatemala is an incredibly diverse country. It is part of the Mesoamerican biodiversity hotspot which is home to 7% of the world’s total biodiversity (on 0.1% of the surface of the world). The region is also part of the Pacific Fire Belt, which is a geologically active zone of volcanoes. Some endangered members of the Guatemalan wildlife family include the West Indian manatee, Guatemalan black howler, Nelson’s spiny pocket mouse, Maya mouse, Derby’s woolly opossum, all wonderfully interesting creatures, with pretty cool names. Guatemala has 37 volcanoes (4 of them active) and 2 mountain ranges on its territory. This rugged terrain combined with dry and wet rainforests forms diverse ecosystems that support this rich biodiversity and wealth. However, deforestation in Guatemala is high. It is essentially due to slash and burn agriculture (79% of lost woodlands), livestock clearing (10%) and commercial agriculture (0.5%). Dry forests are progressively replacing tropical rainforests, which has already started modifying the local climate, and thus the habits of local species, humans included. Since 1970, the average annual rainfall has increased by 13 - 27% across the country. According to previous observations and models, higher temperatures and more variable rainfall will increase the risk of food and water insecurity among the most vulnerable populations, particularly indigenous groups, subsistence farmers in remote locations, and coastal zones. Indigenous people represent 40% of the country’s population. Guatemala has an environment to protect. Climate-related loss and damage over the past 16 years total $3.5 billion. Exposed as it is by its geological and social situation, the country has to create its own way to sustainability, one which involves all people from all origins. The Mayans have gotten it wrong one time with the end of the world, but maybe they can show us the beginning of a new one? Guatemala is ranked as an upper middle-income country by the World Bank. To get a sense of Guatemala’s position in the fight against climate change, it is vital to observe its history of carbon emissions and exposure to climate risk. 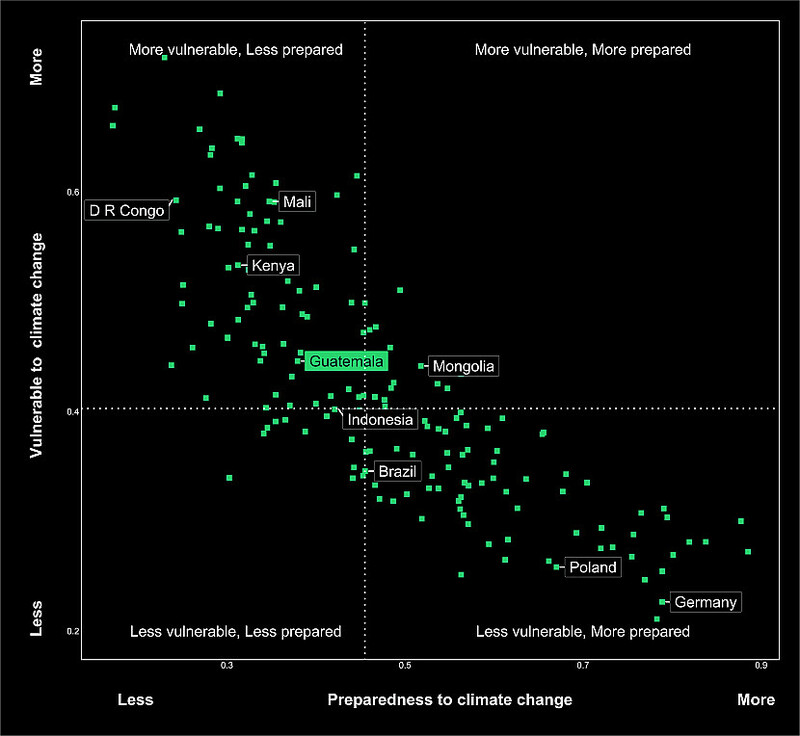 The following plots provide an overview of Mexico’s historic greenhouse gas emissions in perspective with global emission levels, as well as the country’s relative vulnerability and preparedness to climate change. After a rapid increase in its emissions of 370% between 1990 and 2000 (driven by slash-and-burn agriculture and deforestation), Guatemala’s emissions decreased from 2000 to 2008 with a curbing of agricultural methane emissions. 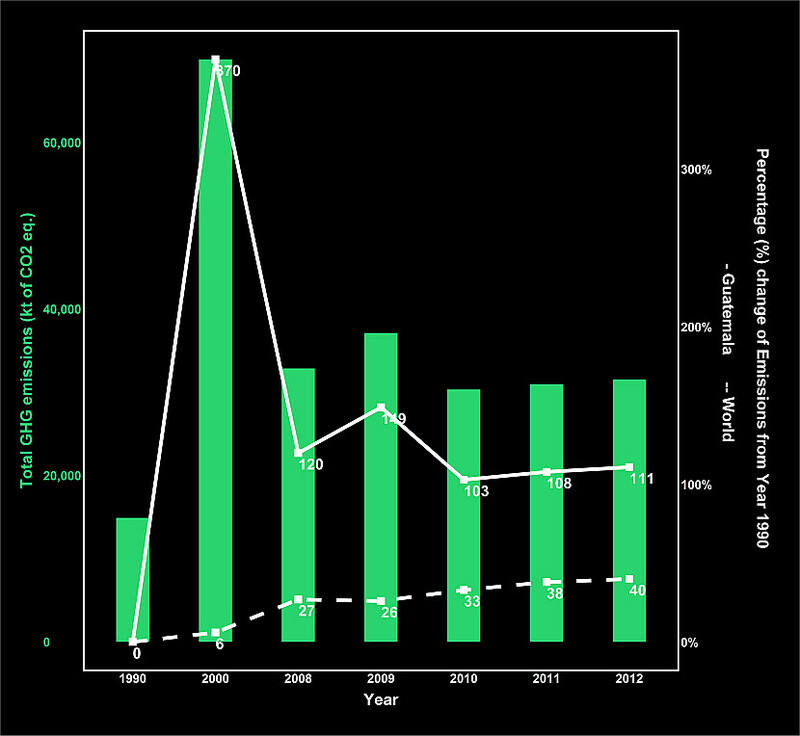 Overall, Guatemala’s GHG emissions increased by 111% between 1990 and 2012. The land-use change and forestry (LUCF) sector is responsible for the largest share (40%) of Guatemala’s emissions, followed by the energy sector (33%). LUCF emissions are mainly driven by changes in forest lands due to logging and the expansion of agricultural activities. Excessive use of firewood also contributes to an increase in Guatemala’s emissions.